This morning I woke up with a pounding headache. And I know I’m not the only one this happens to. About four percent of the population suffers from chronic daily headaches. When this happens, you just want the world to stop…but life keeps on going. So, what is causing these horrible morning headaches, and how can you stop them from happening? 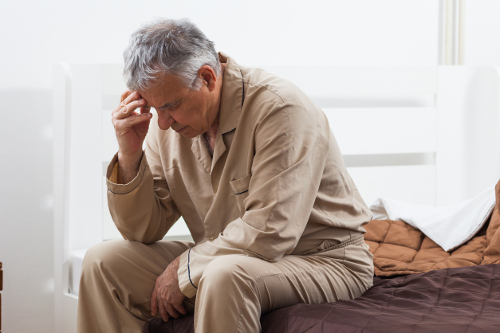 A number of risk factors can cause a morning headache. One of the most common ones is high blood pressure. Adrenaline is released in larger quantities during the early morning hours, and since it affects blood pressure and the dilation or contraction of the blood vessels, it may play a role in morning headache attacks. I recommend that you get a general medical checkup to rule out any hypertension issues. If high blood pressure isn’t the culprit behind these early morning pains, you may be suffering from sleep apnea. Morning headaches have been associated with snoring and sleep disorders. If you have noticed that you are tired during the day, or if your partner complains about your snoring at night, you may want to ask your doctor about the use of a continuous positive airway pressure (CPAP) device to help you sleep better throughout the night. Withdrawal effects from pain medications and caffeine can also play a role in creating morning headaches. If this is what is causing your morning headache, the only solution is to stop taking the specific substance. Depending on how long you’ve been using it, going “cold turkey” can be very challenging and can temporarily lead to even more severe headaches. For this reason, it is best to withdraw from drugs or caffeine under the supervision of a doctor who specializes in treating headaches. Between 4 a.m. and 8 a.m., the body produces less of its natural painkillers, the endorphins and enkephalins, than at other times of the day, so your headache will seem worse during those hours. Headaches often respond well to massage therapy and stress-reduction techniques such as breathing exercises. Yoga and meditation are also proven techniques to reduce stress, and therefore they can help reduce tension headaches. When most people wake up with a headache, they reach for a pharmaceutical painkiller, but these pills come with a list of ugly side effects, like kidney and liver damage, plus they don’t deal with the root of the problem. Try using a natural pain reliever both before you go to bed and when you wake up if the headache is still there. Essential oils are a perfect way to treat headaches naturally because they are safe and effectively treat the headache trigger, getting to the root of the problem instead of minimizing the pain temporarily. They also have no nasty side effects, and you are in complete control of your dose. Two popular oils that are known for minimizing the effects of headaches are peppermint and lavender. To help fight headaches, you dab the essential oil on your forehead, temples, and/or wrist. Follow the directions for use on the product you buy (you may need to dilute it). You can also try skipping that last tea or coffee before bedtime, or making sure it is decaf. If you have a headache throughout the day, try to steer clear of pain medication to avoid canceling out any chance of withdrawal. By trying some of these methods to avoid your morning headache, hopefully you will start to see some relief. I know I am going to do a short meditation and try rubbing lavender oil on my temples before I go to sleep tonight! Thankfully, morning headaches seem to be at their worst in the morning and to lighten up throughout the day. Consult with your doctor if your headaches persist and are affecting your daily life. Morning headaches can be a sign of a serious disease, so it is best to rule out anything that may require immediate attention. Gibson, K. and Lee Page, R., “Early to Rise? Your Blood Pressure May Be Too!” Pharmacy Times, April 1, 2007; http://www.pharmacytimes.com/publications/issue/2007/2007-04/2007-04-6392. “Early Morning Awakening Headache,” National Headache Foundation, October 25, 2007; http://www.headaches.org/2007/10/25/early-morning-awakening-headache/. Weil, A., “Morning Headache?” Dr. Weil, November 1, 2016; https://www.drweil.com/health-wellness/body-mind-spirit/headache/morning-headache/.